Staff at Winson Green prison in Birmingham are being offered £500 bonuses plus expenses to work at HMP Oakwood for a month, a union has said. The Prison Officers Association (POA) also said the Winson Green director, Pete Small, had moved to Oakwood to put a new management structure in place. It comes after trouble erupted at Oakwood, near Wolverhampton. G4S, which runs both jails, said a rotation scheme had been brought in to give staff more experience. 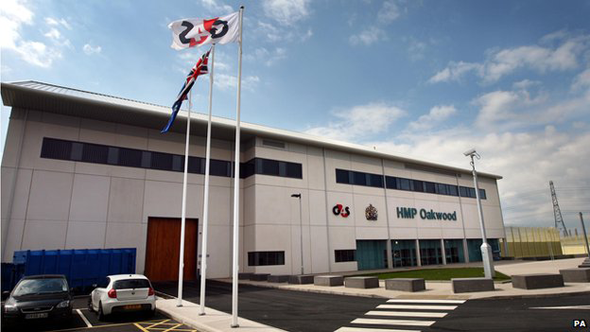 "I think G4S recognises Oakwood is in a right mess," said a POA spokesman. "There is no other reason for them to do that (offer the incentive)." A prison officer speaking anonymously to BBC Radio 4's The Report described this month's violence as a "full-scale riot" in which inmates took over an entire wing. However, G4S described it as an "incident of concerted indiscipline" and said about 15 to 20 prisoners were involved. A G4S spokeswoman said the firm had been placing managers and some officers on short exchange rotations at other prisons to give them more experience. She said the £500 was to reimburse staff for "disruption and inconvenience". The spokeswoman described Mr Small as "an extremely experienced senior custodial professional" who had been brought in to lead a peer review of Oakwood. She added: "This has been planned for some months and has no connection to recent events." The POA is calling on the government to take action to prevent further trouble at Oakwood. "[The violence] demonstrates privately-run prisons are fundamentally flawed," the POA spokesman said. "It's a powder keg waiting to explode." Justice Secretary Chris Grayling has said the site, which has space for 1,600 inmates and is England's largest jail, is meant to be the blueprint for future prisons. However, the chief inspector of prisons, Nick Hardwick, told The Report that new prisons were "very difficult to run" and, although there were some "advantages of scale", big prisons were more difficult to run than smaller ones, he said.